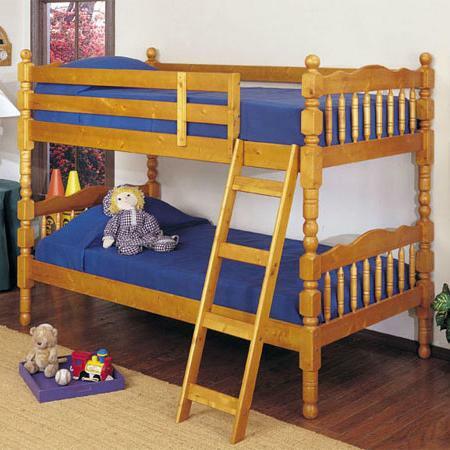 This classically styled youth bunk bed set will bring childhood fun to any kids room. This bunk bed set features an upper and lower bed for two youth to enjoy with a child-friendly style that is light and playful. Smooth finished planks create top-bunk guardrails, blending with the spindle design of the headboard, footboard and legs. Beautifully crafted for childhood enjoyment, this two child bunk bed will lead to days of fun and nights of restful sleep. The 02301 Youth Bunk Bed with Classic Spindle Accents by Acme Furniture at Del Sol Furniture in the Phoenix, Glendale, Tempe, Scottsdale, Avondale, Peoria, Goodyear, Litchfield, Arizona area. Product availability may vary. Contact us for the most current availability on this product.